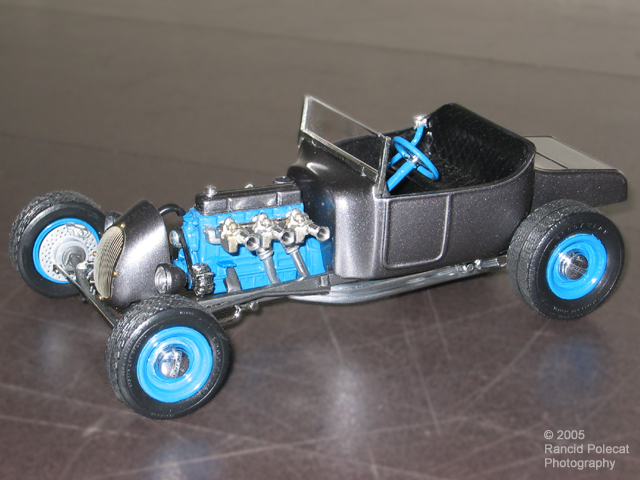 Steve based this project on a AMT/ERTL Switchers 1925 Ford kit. He swapped out the kit grille for a resin track-nose unit from the Model Car Garage which features a traditionally-styled photoetched grille. Steve ran with the kit's chassis pretty much as it came in the box, but he added massive front disc brakes from Pegasus and resin rear drums from the Modelhaus. The wheels are Revell 1964 Chevy Fleetside pickup truck parts with 1940 Ford hubcaps from a Revell 1929 Rat Rod kit and tires from a Revell 1926 T Model Sedan kit. The exhaust pipes you see running along the driver's side frame rail are made of hand-bent 1/8 inch aluminum tubing.